Frank Rollason was recently hired by Miami-Dade County. The new man tapped to help lead Miami-Dade County Emergency Management has been the subject of an inquiry by Florida's Chief Inspector General. Frank Rollason was the manager in North Bay Village before he resigned in January. He was appointed last week to the position of assistant director at the county department. Village Mayor Connie Leon-Kreps says his time in North Bay Village didn't end well. "A lot of issues are still being sorted out and evaluated and investigated," Connie Leon-Kreps told NBC 6. "He wasn't a fit for the Village as evidenced by his departure with no notice." 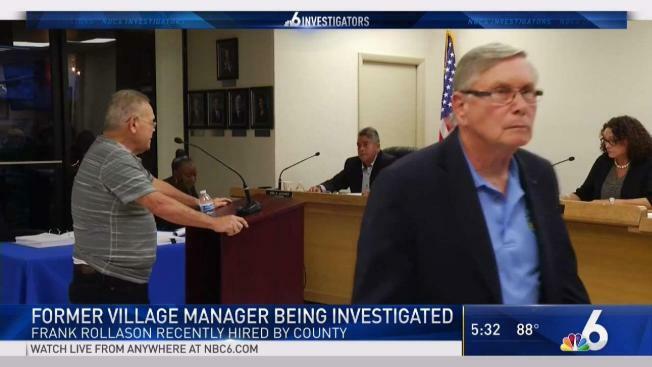 In a document the NBC 6 Investigators obtained, an attorney with the Inspector General's office requested public records from the North Bay Village Clerk. The February request is for documents about "any and all investigations into the acts or omissions of Frank Rollason as related to allegations of official misconduct" dating back to January 2015. Rollason's time as village manager includes what was seen on surveillance video during Hurricane Irma. The video shows coolers being brought into the village hall. An officer is seen using a plastic cup to block the view of a camera. It was like this for nine hours. A fellow officer filed an internal complaint that officers were drinking during the time that the camera view was obscured. He wrote that his co-workers were too drunk to respond to calls for help. Six officers were given a written reprimand and docked leave time they had accrued. Rollason approved the discipline. "It does look awful," Leon-Kreps said. " No city wants to know that their police are drinking alcohol during a time of emergency." Rollason's new boss, Miami-Dade Mayor Carlos Gimenez, is coming to Rollason's defense. "Some police officers did something they shouldn't have been doing and they got disciplined," Gimenez said. "Frank, as the village manager, disciplined them. And then, that's the end of the story." Another North Bay Village incident steaming from Hurricane Irma has been reported to the federal government for investigation. The current administration alleges that, under Rollason, the village improperly submitted claims to be reimbursed by FEMA for $250,000 in overtime. NBC 6 reached out to speak to Rollason but he chose not to comment. The Miami Dade Mayor's Office told NBC 6 they were not aware of any of the investigations or allegations in public documents concerning Rollason and North Bay Village. After reviewing the documents, Mayor Gimenez said he has complete confidence in Rollason. "I know his character and so I knew these accusations were basically false," Gimenez said. "It didn't cause me concern. I have confidence in Frank. He's been a great public servant. He's served in a lot of different capacities in this town, in the city. I'm sure he'll do a great job as the emergency manager for the county." The Governor's office doesn't discuss ongoing investigations and wouldn't say where it is with the Inspector General's probe into Rollason.